A Interim Group Management Report 5 Executive Summary 12 Property-Casualty Insurance Operations 22 Life/Health Insurance Operations 28 Asset Management 32 Corporate and Other 35 Outlook 37 Balance Sheet Review 44 Reconciliations Interim Report Third Quarter and First Nine Months of 2014 Allianz Group 23 Premiums in Central and Eastern Europe grew 9.2 % to € 204 mn. This increase was largely because of business developments in Poland, driven by unit-linked sales via bancassurance, and to a lesser extent in Hungary, mainly due to the timing of a single premium unit-linked sales campaign. This growth more than compensated for the decline in premiums in Russia as a result of the termination of one bancassurance partnership. In Switzerland, premiums totaled € 201 mn. The increase of 7.3 % was primarily driven by our single premium business in group life, and to a lesser extent in individual life. In our German life business, premiums grew 4.0 % to € 4,292 mn. This growth was driven by an increase in our single premium busi­ ness with savings products while regular premiums were relatively flat. In particular the product Perspektive – which was launched in the second quarter of 2013 and balances reduced guarantees and higher expected returns for the policyholder with lower capital requirementsfortheshareholder–contributedmostofthe premium growth.StatutorypremiumsinourGermanhealthbusinessdecreased 1.9 % to € 816 mn due to a lower contribution from full health care cov­ erage business. Premiums in France increased 1.4 % to € 1,975 mn. All lines of business contributed to this growth, with the exception of individual life business, which we pursued more selectively. Premiums in Spain decreased 3.9 % to € 188 mn. This was mainly a result of a more selective growth focus. Overall, we achieved a pre­ mium mix shift in favor of more profitable protection products. The decrease was partly offset by improved business via our bancassur­ ance channel. In Benelux1, premiums decreased to € 368 mn, representing a decline of 13.0 %. This was mainly due to lower sales of investment- oriented products in Luxembourg distributed via the bancassurance channel. 2014 to 2013 first Nine Months comparison Statutory premiums were 20.0 % above the first nine months of 2013 and amounted to € 49,977 mn. This represents an increase of 20.5 % on an internal basis and was largely driven by our strong single premium fixed-indexed annuity business in the United States, and, to a lesser extent, by an increase in the savings product business in Italy and Germany. 1 Belgium, Luxembourg and the Netherlands are presented as the combined region Benelux. All prior periods are presented accordingly. 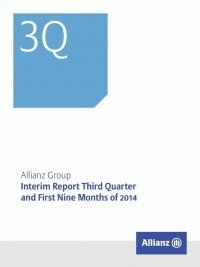 Operating profit 2014 to 2013 third quarter comparison Operating profit increased slightly by € 22 mn to € 790 mn. The alloca­ tion of certain entities previously reflected in the business segment Asset Management to the business segment Life/Health drove this improvement. Our operating performance was almost flat as the improved operating investment result was largely offset by associated policyholder participation and higher acquisition expenses. Interest and similar income (net of interest expenses) increased by € 121 mn and amounted to € 4,233 mn. This was driven by higher interest income from debt investments as a result of an increased asset base. Operating income from financial assets and liabilities carried at fair value through income (net) improved by € 330 mn to a loss of € 207 mn. This was largely due to higher losses in the third quarter of 2013 from the net of foreign currency translation effects and financial derivatives used to manage duration and other interest rate-related exposures as well as to protect against equity and foreign currency fluctuations. Operating realized gains and losses (net) increased by € 205 mn to € 746 mn. This was largely due to higher realizations on equity investments as well as on debt securities compared to the third quar­ ter of 2013. Operating impairments of investments (net) increased by € 77 mn to € 102 mn. This was due to higher impairments of equity invest­ ments. Fee and commission income increased by € 96 mn to € 263 mn, mainly due to income generated by entities transferred from the business segment Asset Management. Claims and insurance benefits incurred (net) increased by € 361 mn to € 5,004 mn, largely because of higher payments for matur­ ities in Germany. Change in reserves for insurance and investment contracts (net) remained almost flat at € 3,175 mn. An increase in Germany driven by ahigherchangeinreservesforpremiumrefundsduetotheimproved investment result was largely offset by a lower increase in aggregate policy reserves because of higher maturities and lower net premiums earned. Investment expenses increased by € 20 mn to € 219 mn, mainly due to higher asset management fees. This was the result of a higher asset base and one-offs in the third quarter of 2014.